Antonia Bird was brought onto the project three weeks after shooting began when the first director quit. Apparently, it was Robert Carlyle who recommended her. The title sequence up at the beginning of this post actually comes about five minutes into the film. 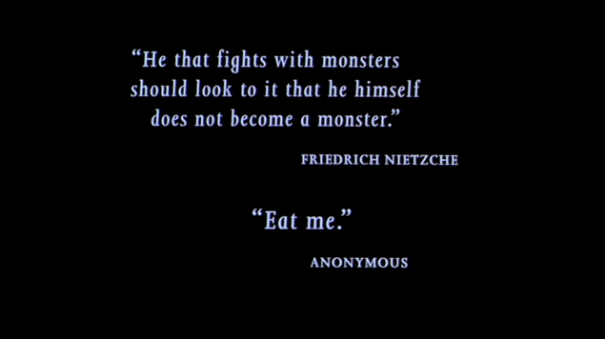 It actually starts with these great quotes, setting the film’s tone. 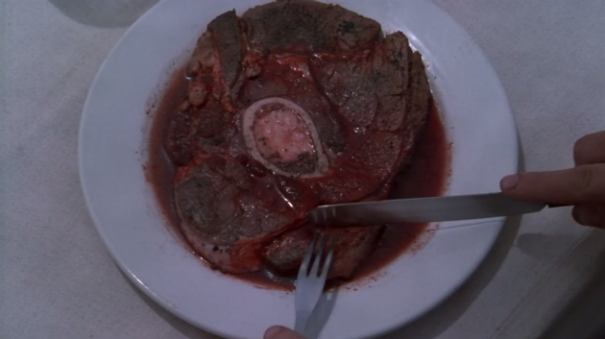 There’s a lot of gross shots of meat in this movie. If you don’t already know, the film is about cannibalism and Bird continues to play with this theme by juxtaposing in these shots of the regular animal meat people eat all the time, but looking really fucked up. 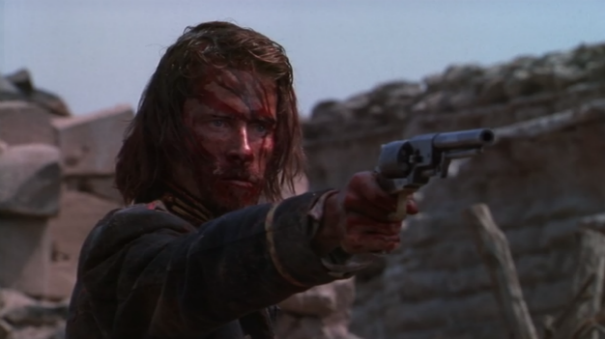 The basic plot is that during the Mexican-American War a Lieutenant named Boyd (Guy Pearce) chickened out during battle and was the only survivor by playing dead, blood from his fellow soldiers dripping into his mouth. When the cart of dead bodies he’s hiding on gets wheeled into the Mexican camp, he finds some bravery and single-handedly captures it. This makes him a hero; until they find out the truth and then the Army sends him to a remote outpost in the Sierra Nevadas as punishment. I like how the blood color on the humans looks just like the blood of the meat. It makes it all the more disturbing. There, Boyd learns about the story of the Wendigo (who ate of human flesh and then was cursed by an insatiable desire for it). 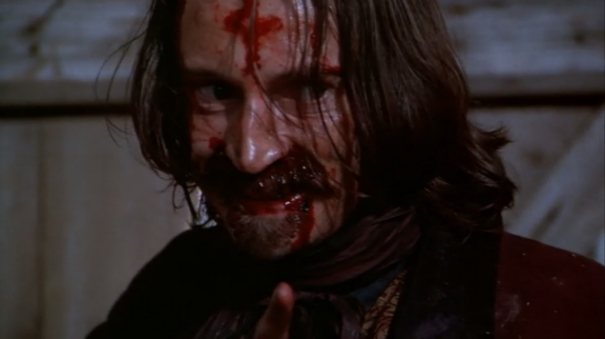 A strange comes into the Fort (Robert Carlyle), telling a tale of how he was in a wagon train that got lost and had to resort to cannibalism to survive. His telling of the tale is very similar to that found in the book The Thin Man by Dashiell Hammett. The stranger turns out to have more secrets than they bargained for. 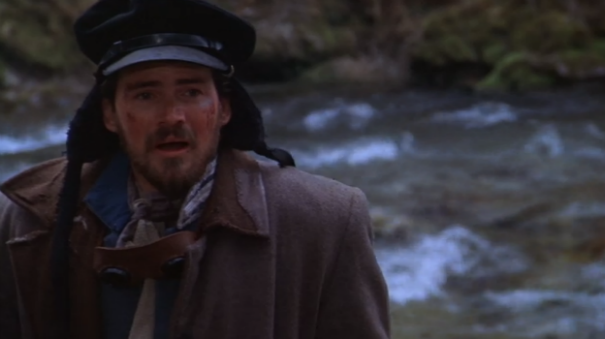 This is just a picture of Jeremy Davies. He’s one of the soldiers at the Fort. He is so cute. His character does not see a good ending. 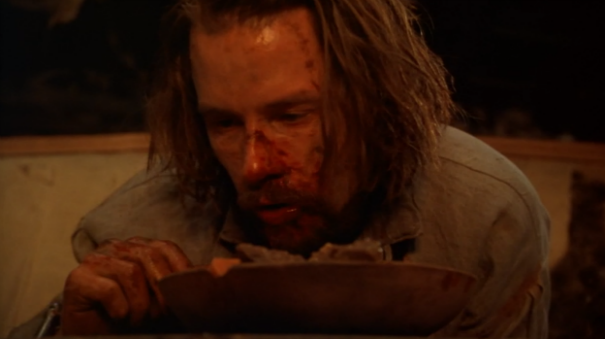 Look how beat up Guy Pearce looks! 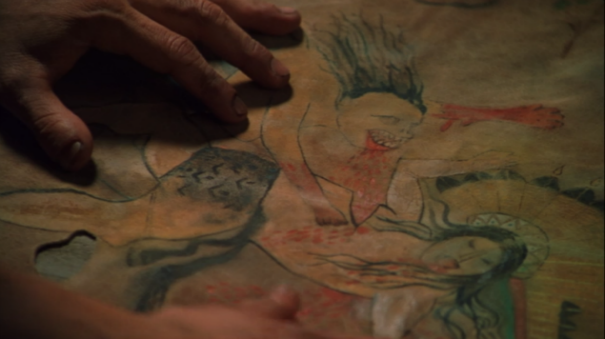 There’s a lot of this in this movie and I thank Antonia Bird for it. They really look like they’ve been through Hell – as they should! 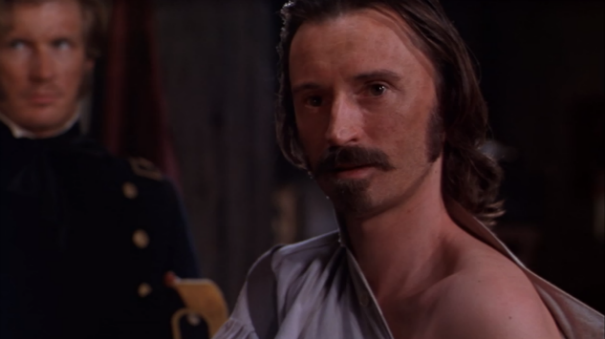 Here’s Robert Carlyle all cleaned up (when we first meet him, he’s a mess). 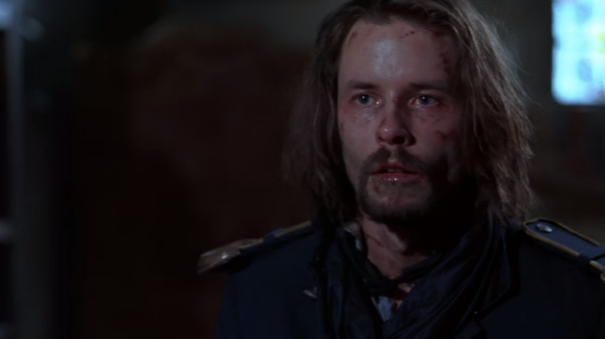 While I really love Carlyle’s performance in The Full Monty, this may well be my favorite of his performances. He’s so devious and also quite hilarious. Food shot! So many food shots. You should probably eat before you see this movie because you won’t want to eat after! David Arquette is so wacky in this movie. The first time I saw it, I thought his performance was a little over the top, but upon rewatchings, I came to really love what he did with this part. He, too, doesn’t not get a Hollywood ending. Food and blood! Blood and food! That’s basically what you’re going to get with this movie. Also, what is he eating? You don’t want to know. Look at this face! So gross! So good! There’s a lot of tongue-in-cheek dialogue about eating and meat and cooking, etc. in this movie. It’s all a little irreverent, but I think it’s the only way to tackle a subject like this and still have a movie regular people can watch over and over. I hope you get a chance to see this soon! Happy Halloween! 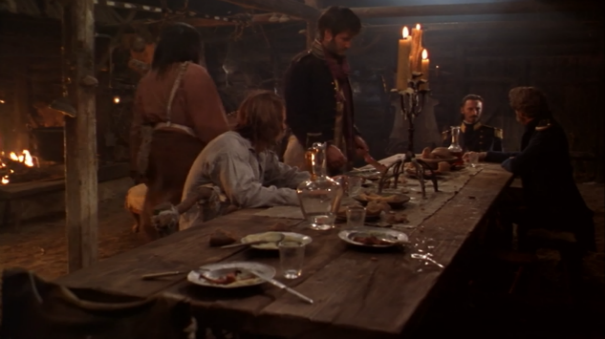 Posted on October 31, 2014, in Female Filmmaker Friday and tagged 1999, Antonia Bird, David Arquette, Guy Pearce, Jeremy Davies, Ravenous, Robert Carlyle. Bookmark the permalink. 1 Comment.